Endothelial cells have presented a wide variety of applications including tissue engineering, artificial organs, and pharmaceutical drug screening. 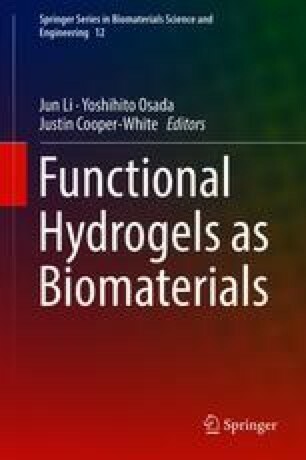 The new insight in exploring synthetic hydrogels which are suitable for expansion of endothelial cells and keeping their original functions will open a new era of soft and wet biomaterials as active templates for cell expansion. In this chapter, we introduce a cell culture system based on protein-free synthetic hydrogels for expansion of endothelial cells. The negatively charged synthetic hydrogels, such as PNaAMPS and PNaSS, can promote endothelial cell proliferation to form a monolayer, without surface modification of any cell-adhesive proteins or peptides, under the environment of serum-containing medium. Moreover, the synthetic hydrogels can maintain the original functions of the expanded cells. In the sections of the effect of chemical structure and zeta potential on cell behaviors, we introduce the effect of physicochemical properties of fully synthetic hydrogels, i.e., chemical structure, charge density, and surface topography, on static cell behaviors (adhesion, spreading, morphology, proliferation, cytoskeletal structure, and focal adhesion) and dynamic cell behaviors (migration velocity, morphology oscillation). In addition, the effect of hydrogel properties on cell behaviors is correlated well with the adsorption of protein derived from cell culture medium. In the section of application of protein-free hydrogels in biomedical field, the platelet compatibility and surface friction of endothelial cell monolayers cultured on hydrogel templates, selective cell adhesion and proliferation on micro-patterned hydrogel surfaces, as well as proliferation of endothelial cells on tough hydrogels are introduced.